That's right. I'm addressing you. It feels weird to be writing a letter to an entire theatrical production. I've never done this before. So please excuse any awkwardness. I must admit I wasn't quite sure I was up for a work about American democracy, one asking these questions: "How are freedom and democracy packaged and promoted in America? What does it mean to be free in America? As America becomes more consumer-driven, polarized and disenchanted, is America living up to its promise?" Not after grueling months of our cringe-worthy pre-election process. Not after the shock of Brexit, across the pond, with its ugly, racist roots that mirror our own shame. Not after Orlando and the reminder of what horror can come of so much unrelenting political dysfunction, opportunism and irresponsibility. 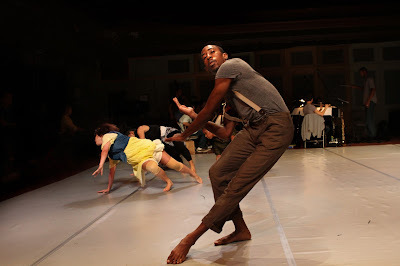 But I took up Edisa Weeks's invitation to see you at Gibney Dance: Agnes Varis Performing Arts Center, and I encountered you--a collaboration in dance and music that feels so much like a living, breathing person that I must write you this letter. Strange, isn't it? A dance company--say, Weeks's Delirious Dances--is certainly made up of individual people. Likewise, Numinous, the ensemble directed by Joseph C. Phillips Jr., your composer and conductor--is made up of real people, too. And yet, in over four decades of writing about performance, I have never had an entire event reach me and affect me with the sensitivity and focused power I'd normally associate with a single human being. And I know there's a single human being at the root of your artists' concerns--philosopher Thomas Paine, a man of reason tapped by Weeks and Phillips in this age of irrationality. But it isn't Thomas Paine or any other founding father who comes through. It is you. And you come through, first, in Phillips's music, especially the bright, brisk uplift of his opening, "Reel Liberty." In that music, your flutey, bell-toned, energized voice dances. You appear before us as a dance we hear in our ears. As you proceed, you will sing with different voices, bringing the words of Paine and more recent speakers to us. By the time you've finished--in "We Have It In Our Power"--your voice will echo like a hypnotic mantra, soothing yet also designed to ground, direct and inspire. You are also in the voice of actor Michael Henry. I peg him in my notes as "the white man." And, of course, although other dancers--two Black men, one Black woman, an Asian woman from Singapore and a white American woman--gently greet us with baskets of fortune cookies and noisemakers, it is Henry whose forceful, crackling voice permeates the space with authority and no small measure of demand. Everyone, for instance, absolutely must get a cookie, or he won't be satisfied. He throws them out at us. The woman to my left gets the "fortune" I'd wish for--"My mind is my own church. -- Thomas Paine." Damn! That's it exactly. Instead, I get something fairly obvious and dry but adopt my neighbor's "fortune" as my own, as an affirmation of my entire life. So, thank you. You also appear through the energy of Weeks's five dancers, as mentioned before, a representation of diversity--Ardella Bang, Angel Chinn, Johnnie Mercer, EmmaGrace Skove-Epps and Ricarrdo Valentine. If there is anything here resembling the hoped-for "shining city on a hill," they are the ones who have built it. That's what their dancing shows me as their movements clear, carve, define and hold space. Their extensions, tumbles, runs, whirls, lunges, stretches and rolls, continuous and seamless, demonstrate labor and determination without which nothing would be here. Weeks's choreography--here and in later sections--reveals your unfussy, transparent, accessible nature. You long to tell your bittersweet story and unburden your heart. For every time I've grieved that a good dance--or a great dance--will be seen by relatively few, I grieve harder to think that that could be your fate. You have been wonderfully made for the many. Please do not fade away. I'm moved--eyes tearing--by how you sweep your audience into your story, your meaning, your humanity, teaching us and revealing us to ourselves. So much sweetness. Yes, the problems are old, hard, complicated, even perilous. But the feelings? Can we get to feelings that could help us begin anew? At the end, I rise from my seat and catch a friend flicking something from her eyes. "You, too?" I ask. With costumes by Sarita Fellows, lighting by Tim Cryan and live music by Numinous (Matt Aronoff, Mike Baggeta, Katie Cox, Maria Jeffers, Bogna Kicinska, Thomson Kneeland, Ana Milosavljevic, Adrian Sandi, Tammy Scheffer, Carmen Staaf and Emilie Weibel), conducted by Joseph C. Phillips Jr.
To Begin The World Over Again concludes with a Family Night performance tonight at 8pm. For information and tickets, click here. For Family Night, the company will offer free activities and care for children of all ages from 7:30-9:30pm. Space is limited for the free childcare, and the required RSVP registration was projected to end at 5pm Friday, but you can check to see if space remains: http://bit.ly/EdisaWeeksFamilyNight.